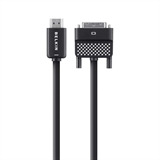 This HDMI to DVI Cable is ideal for connecting a laptop with a DVI input to an HDTV so you can watch movies and TV shows, view photos, and more on the big screen. Use it to show presentations on a larger display or expand your workstation with a mirrored desktop. Compatible DVI-enabled devices include MacBooks, ultrabooks, laptops, and tablets. Note: This cable is equipped for video only. A separate audio cable is needed to stream audio. The HDMI to DVI Cable supports a video resolution of 1080p, making it ideal for visually rich presentations or films. A high-quality molded-strain relief at the connection points provides flexibility when connecting devices, reducing strain on the cable.